You can enjoy living in a trailer but there are new chores that come with the lifestyle. When one buys a travel trailer (TT), it's usually for recreational purposes but sometimes, people elect to live in a trailer. 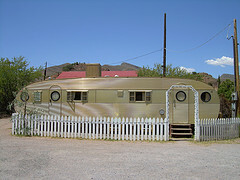 This type of camper is generally larger in size and is towed. While offering the conveniences of home while traveling, when stationary long term, it is a choice that only a few may want to consider a residential option. While a fun vacation choice, it can become a nightmare if you decide to move in long term and then later suffer from keeping up with repairs and cosmetics on your abode. 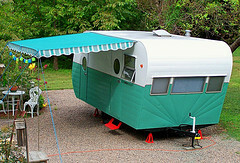 Travel trailers were intended to serve a temporary function and not for long term living. Therefore, the parts on a TT are not going to last the same length of time as the parts in a home. The cabinet doors will fall off within the first year of residency, there may be unexpected leaks or water issues, the insulation factor will be very limited and you will most definitely have to deal with sewage. The trailer's cabinet doors look good but aren't as durable as your home cabinet doors. The cabinets are designed for gentle and temporary use. The screws and hinges are not deeply rooted, as they might be in a home's kitchen cupboard. You may soon end up replacing screws with longer screws... and longer screws, shoring up the inside of the cabinet for even longer screws and... well, you get the point. But once that's done, you're okay! Now, it's not like all your cabinet doors will just fall off one day. Instead, they will fall off one at a time. If you don't repair these doors right away, you will soon have a collection of cabinet doors waiting for an entire weekend of repair. 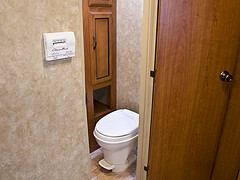 A typical trailer toilet is made of plastic. Don't break it by stepping on it! The leak may come from anywhere. It could be the roof, the wall, the floor (water pipes often found under the sofa sleeper) or the windows. It also could be a sink-related issue with the leak coming from the faucet or under the sink, into the cabinet. It could be a slow drip from the tub or shower. But, eventually, a leak will find you. Seasoned trailer owners know to be proactive in maintenance to avoid just such a potential problem. They climb to the top of their rigs to take a careful look at the roof top each summer and complete any sealing or resealing while the weather is good. If you are not prepared for that, you may want to reconsider owning a big camper. But, if you don't mind, it's just part of the experience of being a trailer owner. "There Is No Insulation On A Trailer"
The saying "there is no insulation" is a bit of an exaggeration. Actually, most travel trailers do have a very thin and small amount of insulation but unless you do some custom improvements to your rig, it will feel like there is no insulation at all. 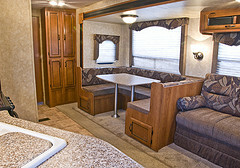 For our purposes, we are discussing the standard travel trailer - not the one million dollar kind. In your average travel trailer, it can get downright freezing when living in a trailer in a cold climate. There are two options: heating or terrific bedding. The first option can become expensive, if you find it necessary to run the heater all the time, no matter which source generates the heat (propane or electrical). You may find it easy to heat the rig but you will also find it hard to keep the heat in. There are just too many locations for the heat to escape, especially on rigs with slide-outs. The other side of the spectrum is that if you are parking your camper in a desert or in weather exceeding a hundred degrees, without air conditioning or, at a minimum, a fan, you will be too hot to stay in your rig, even if you open every window. The solution is an air conditioner but this comes with pitfalls too. An air conditioner can override the system and blow a fuse. Are you comfortable with keeping all the other appliances off and using minimal electricity when your air conditioning unit is running? Are you willing to pay a fair amount of money if your air conditioning unit breaks? Unlike a home, there is no "cool room of the house" to escape to. The square footage is so small in a trailer that you will soon feel as though you are in a sauna without any type of air movement available. It's illegal to have your sewage all over the ground. It has to be cleaned up the right way. The blue hose is where the black water or sewage exits the rig. This man is emptying the sewage tank. The Sewage Remover - That's You! 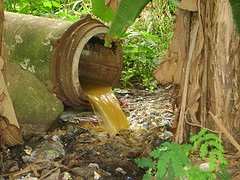 Sewage removal should not be overlooked. It's important to know how to hook up and unhook your sewage connections. How will you handle it if your sewage line breaks, because it will be up to you to take care of it (and the sewage spill!). Sometimes sewage lines pop out of the ground. Take care to ensure yours doesn't by either placing a weight on it (this can big a large rock or a couple of bricks) or using a special attachment to "keep it in place." But sewage removal isn't just an outside experience. 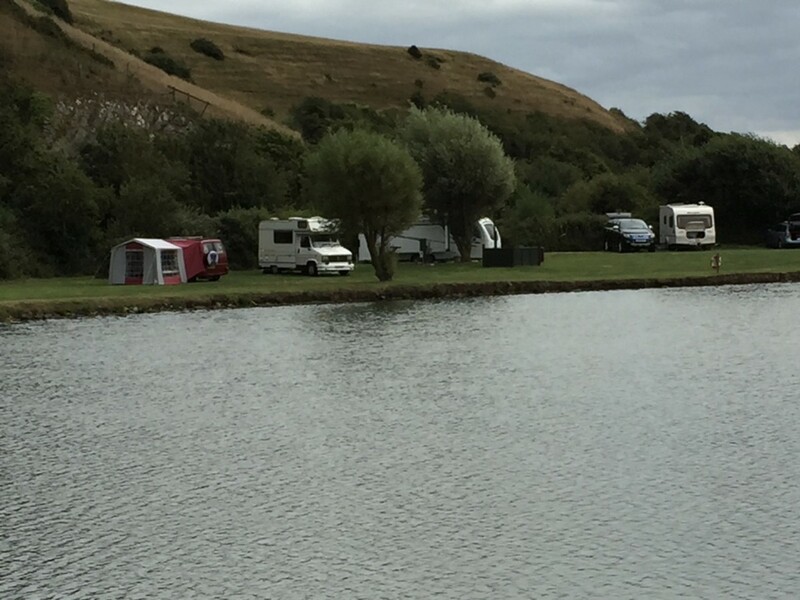 If you are not familiar with trailer life, you should know that without proper care, the sewage smell will back up from your toilet and pollute the air space in your trailer. There are particular products sold to neutralize sewage smell while simultaneously breaking it down. If you prefer regular toilet paper, you'll need to throw it away in a garbage can after use because travel trailer toilets can only flush RV safe paper - a special type of dissolving TP (which just happens to have thin sheets!). But, the question is, when the toilet backs up (sometimes that happens - especially if you flush paper! ), are you prepared to unplug it yourself? Or call an expensive service to do it for you? 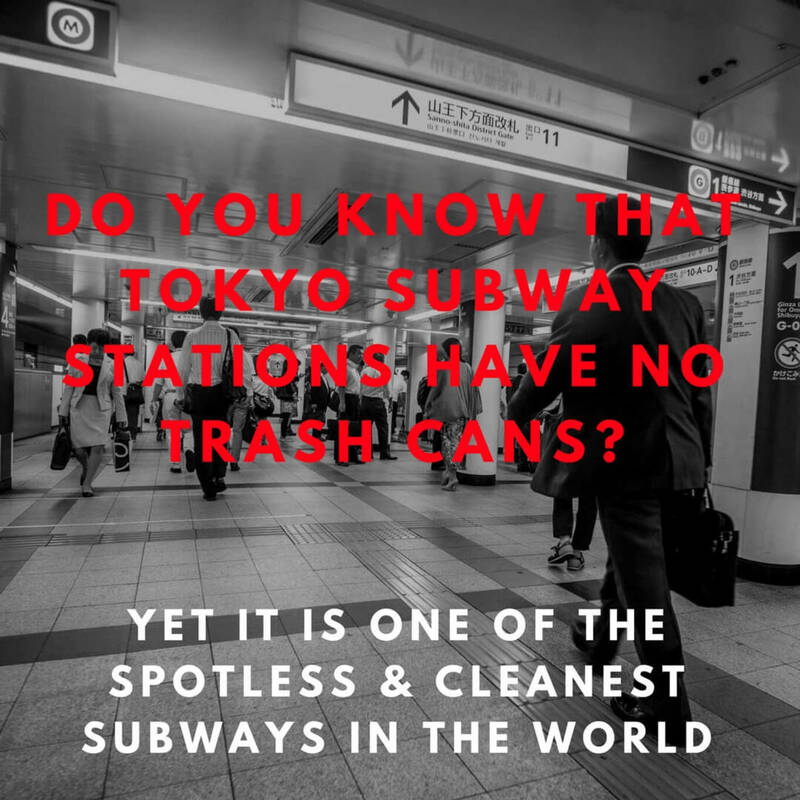 If the sewage overflows outside, are you willing to shell out the big bucks to have a service clean it up for you? A trailer can be a pleasant abode, as long as you're comfortable with the upkeep. I have owned trailers and will likely purchase another in years to come. For heating and air conditioning, there are some non-standard solutions that won't be on the showroom floor when you buy your rig but can be installed by you or a handy person you know. Since this article is about potential negative aspects, we will not go into problem solving in this article. Repairing cabinet doors and plumbing is part of the experience and I accept that. I don't mind the maintenance and I don't mind paying for the extra heating and air conditioning costs needed to feel comfortable. But, are you? You may feel that you are being attacked by your own trailer otherwise. Congratulations on your Hubnuggets nomination! Follow this trail to read and vote https://hubpages.com/community/An-Invitation-To-A-... Have fun! Good information thanks for sharing it. Good job. Cheers.